Spring is here and most of us are so excited about wearing our florals, pastels and bright colored garments, but at the same time, we don't want to fully give up to our black outfits. I personally have a hard time denying myself a little black dress or a comfortable black jumpsuit. But how can we wear our black garments around this time of the year and still look light and fresh. It's a no brainer that wearing thick garments, regardless of the color, isn't practical for Spring, and mainly at the end of the season. Instead, bring to the lighter fabric (linen, crepe, jersey...etc), to the front of your wardrobe. My favorite and easiest tip for giving lighter weighted black garments a Spring feel, is to wear them with accessories made of natural materials, such as cork, wood, ropes, barley, whicker or straw. Espadrilles: Castañer. See an incredible selection here. Jumpsuit: Madewell (sold out). Try this similar lightweight style. 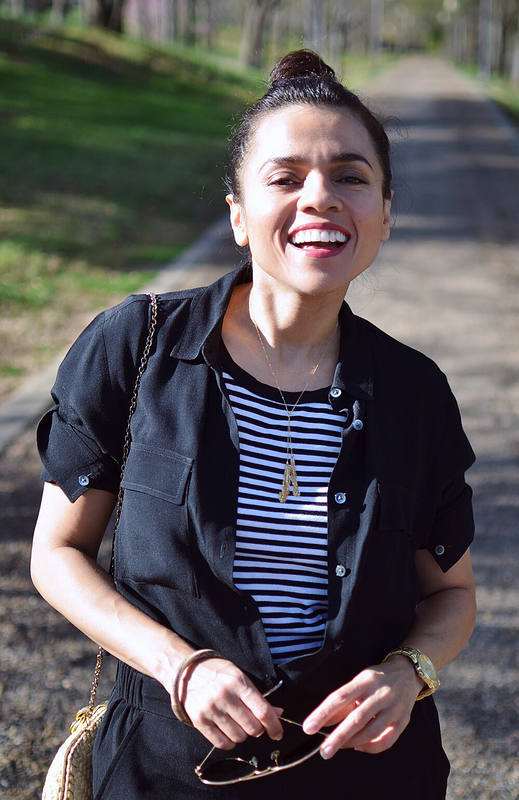 Necklace: c/o JTV.com. Congratulations to @rsam0823 for winning the giveaway. Bag: Vintage. I love this with a tan. 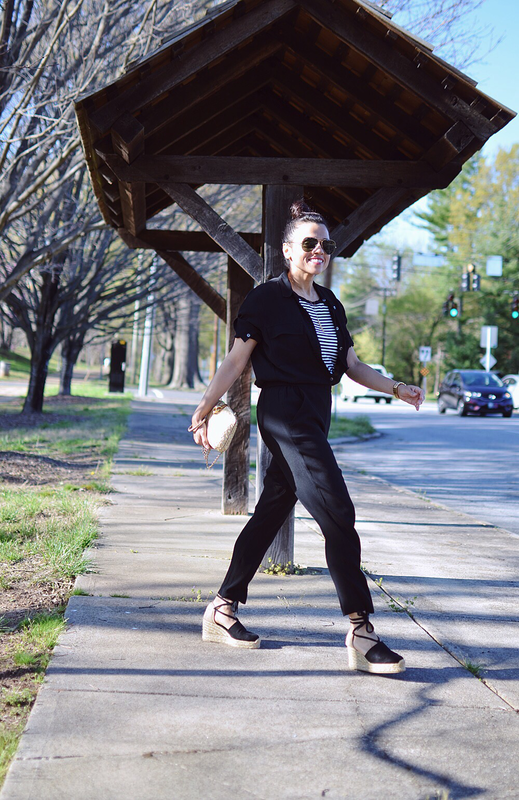 A couple months ago, I wore this black jumpsuit with a heavy vintage coat (see it here). It was cold and windy, so I needed a longer coat to keep most of my body warm. One of the many positive things about thiner fabrics is that we can wear them all year round, layering them around the cooler weather seasons. That's the exact reason why I opted for this jumpsuit. I knew it was going to be versatile and fun to wear with whatever I please. Estás preciosa!!! Un look muy relajado y con mucho estilo. Un saludo! A cool casual look...and the black makes a nice variation.